From Tristan Tristar of the Adonis Cabaret, a self-confessed hen expert who organises hen parties for 35,000 hens a year and who really knows his hens from his ducks. Now this can be a nightmare before you even start! Usually left to the maid of honour – is she expected to invite ancient Auntie Ethel? Or the old school friend that no one but the bride can stand? If you think people will clash, split the day into different sections – the tranquil safe spa day (ideal for the mother in laws and party prudes) and the wild party in the evening that you know the bride will love! Or if there is an extreme divide, consider having two hen dos – there is nothing worse than having one or two people that don’t join in with the fun, or worse, ruin it for everyone else. Choose a day or weekend at least a week before the wedding and do not under any circumstances hold the hen night the night before the wedding. Plan well in advance so that you can maximise the numbers who are able to attend. This is the bride’s big night so make sure all her best friends can be there. Cash is king and money can be a real deal breaker for some. Make sure you set a realistic budget for your intended guests whilst retaining the feel of making a special effort for the bride. It can be a difficult balance and may well effect the ‘who to invite’ list above and the ‘location’ below. But don’t settle for the “I’ll pay you later” – this only leads to resentment when you find out that that friend just splashed out on new shoes! Do your research! We have seen all varieties of hen dos, from a night at someone’s house or at the local pub, to international city breaks in Europe and beyond. Marbella is a top destination this season and there are some amazing deals out there at the moment. A hen night is often an excuse for some quality girl bonding time and therefore location can be key. But wherever you decide, make sure you check out the best places to go (and the places to avoid!) before setting off. It may sound silly, but if you choose to go abroad then check that everyone has a valid passport – you don’t want any tears at the airport!! I know this could lead to a mine field of arguments but try to involve the other guests. Don’t be so vague as to ask “right girls, what are we doing” because this will result in a barrage of conflicting ideas, but let them know your plans and see if they can add anything to it. Remember, there will always be someone who doesn’t agree, but you can never please everyone. Go with what you feel the bride will want. Most brides want their hen dos to involve a good party and probably a little bit of naughty drinking. 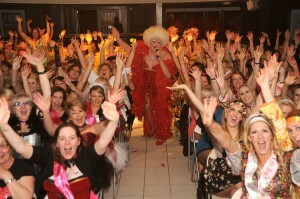 The most popular evening activities are comedy clubs, drag cabaret, strip shows and then – most likely – onto a nightclub. Adonis Cabaret, for example, puts all of those brilliant activities together in one venue, to make it easy for you and give you just the right mix for everyone. But also consider day time activities – a girly spa day, beauty treatments or afternoon tea to make the bride feel really special. 7. That said, don’t go overboard. It always seems that there’s not enough to fill the day but once you are all together catching up & gossiping, time soon flies. (We have experience of this first hand – get a group of girls together and you can’t get a word in edgeways!) Be flexible with your plans. If the group seem to be happy, don’t rush off to the next activity just for the sake of it. This seems really nerdy, but how many rows do you think are caused when groups are drunk and lost in a strange city? It is not long until everyone will really start to panic. Make sure everyone knows when and where to meet on the day. Perhaps send an itinerary out beforehand and exchange mobile numbers. Once you are all there, establish a meeting point just in case anybody gets separated from the group & mobile batteries die during the evening. This is especially important if you are out for the whole day or weekend. You don’t want the bride (or anyone else) to be legless by lunch time & not be able to enjoy the evenings shenanigans. So make sure you factor in some down time for eating & hydrating with soft drinks or water. 10. Finally, relax, enjoy the day and have fun!! The Adonis Cabaret holds the UK’s hottest hen nights, combining male strip, drag, cabaret and comedy – all in one huge package, performing at venues in London, Brighton, Blackpool, Bournemouth, Leeds and Newcastle.